On 10th February 1871 a storm of fatal severity swept into the calm coastal port of Bridlington Bay. With it rode dozens of helpless ships and it fell to local lifeboat crews to brave the implacable sea in attempts to save the floundering crews. Many of those heroic souls never returned to shore. 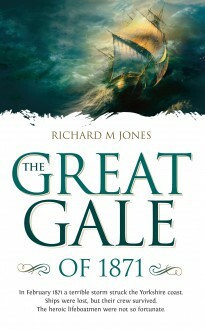 In his detailed examination of the events of The Great Gale of 1871, Richard M Jones shows the horror of the disaster alongside the selfless heroism of those rescuers. Among the individual stories of the storm is that of the Harbinger lifeboat and its crews’ ultimate sacrifice for their fellow sailors. The Great Gale of 1871 presents the events and the legacy of that fateful day.